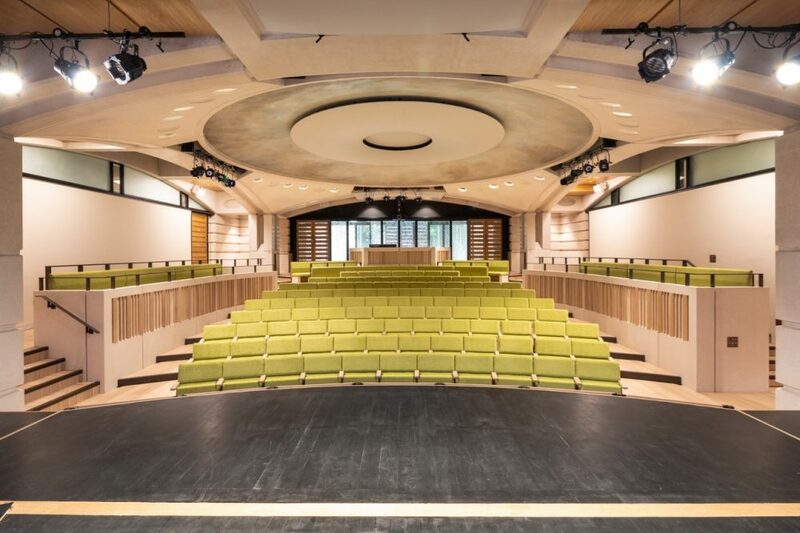 OXFORD, U.K. – Sound Space Vision and architect Alan Berman and Berman Guedes Stretton architects teamed up to renovate the acoustics inside the Garden Quad Auditorium at St. John’s College. Sound Space Vision joined forces with architect Alan Berman and Berman Guedes Stretton architects to deliver a revitalised Garden Quad Auditorium to better serve the needs of St John’s College’s busy calendar of events. The newly modernised Garden Quad Auditorium begins its season of events this autumn. As the penultimate quadrangle of Oxford University’s St John’s College, The Garden Quad was designed by revered architect Richard MacCormac (MacCormac Jamieson Pritchard). Within the 1994 quadrangle is the Garden Quad Auditorium, providing the college with a lecture, performance and event space. The College’s aim was to make the room more comfortable, with improved sightlines and acoustics, wheelchair access to both the seats and the stage, and reduced services noise whilst maintaining a seat count of at least 180. There was also a desire to bring the lecturer/performer closer to the audience, and a need for the Auditorium’s technical, production and acoustics capabilities to match a busy calendar of lectures and musical events of all kinds. Sound Space Vision (SSV) joined architect Alan Berman to develop a new interior form which met these requirements, with Marion Brereton of Berman Guedes Stretton architects (BGS) taking it through to detail and completion. The result is an auditorium that has been shortlisted for the AJ Retrofit Awards 2018 (Higher and Further Education). The newly re-raked floor and more intimate seating design has enhanced the sightlines and acoustics, and a mechanical forestage can extend the stage area, improving the connection between the stage and audience and offering wider presentational possibilities. The forestage can also be lowered so the area can be used as an orchestra pit for musical theatre. Wheelchair accessibility to the entire space is satisfied by eight wheelchair positions – six with direct access from the foyer and two positions available by mechanical stair lift – and, crucially, wheelchair access directly from the hall to the stage.The raked and curved seating shape in the Auditorium, along with light green seat material, pale oak flooring and accents, and a new lighting scheme, has refreshed the hall’s overall aspect and tone. Improvements to the ventilation system add to the hall’s comfort while an underseat air displacement system recommended by SSV and engineered by Maleon distributes a constant supply of air evenly and quietly, replacing the previously noisy, inefficient system. Theatrical and performance goals have been met by creating production lighting positions and introducing new dimming systems, LED lighting, and an integrated all-digital sound system for lectures, drama and musical events. At the specific request of the Client, the SSV team developed an integrated open-control position for the production desk at the rear of the audience to maintain the view of the art-glass screen designed by renowned artist Alexander Belschenko at the back of the Auditorium. Improved backstage facilities include new show and video relay to dressing and green rooms along with improving the working lights and performance blues, and new digital lighting and sound control consoles. – Anne Minors, Design Principal, Sound Space Vision. Central to the College’s brief was a desire for the Auditorium to be used for performance activities unachievable in the original hall, particularly chamber music and musical theatre. SSV evolved the room shape to counteract the acoustically dead space caused by the existing low ceiling height and central dome, removed the carpeting, and chose materials specifically to match both the physical needs of the Client and the acoustic requirements. A number of other passive solutions were also introduced to significantly upgrade the room acoustics, including a moveable orchestra shell, a proscenium sound reflector and an inverted dome reflector to promote a more even distribution of sound, strengthening intelligibility for unamplified speech, increasing acoustical performance for unamplified music, and improving on-stage communications for ensembles. A new electroacoustic enhancement system increases the clarity and/or reverberation of the hall acoustic depending on the programming, with or without the stage extension in place. The system transforms the dry natural acoustic to a more reverberant environment for the full spectrum of unamplified recitals, and also provides voice-lift for hands-free speech reinforcement. A dedicated cinema surround-sound system with the digital video was also included. The refurbished Garden Quad Auditorium can now play a new, more dynamic role as St John’s College’s cultural and entertainment hub for its students, faculty and the surrounding community.